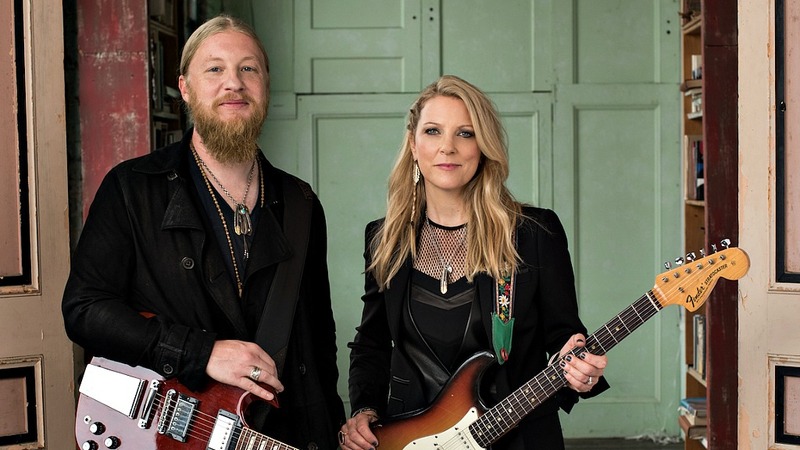 Blues guitarist and singer Susan Tedeschi of the Tedeschi Trucks Band has been on the road for months, touring with her husband and fellow guitarist Derek Trucks and their many bandmates (including Tim Lefebvre, who participated in FUV's David Bowie roundtable), and supporting the group's third release, the expansive, funk-lashed Let Me Get By. In fact, the Tedeschi Trucks Band also made a visit to FUV's Studio A earlier this winter for an FUV Live session. Before joining forces with her husband, the Boston-born Tedeschi was also on her own as a solo performer, nominated back in 2000 for a Best New Artist Grammy, a big feat for a blues artist (she lost to Christina Aguilera). Tedeschi opened for the Rolling Stones, Bob Dylan, and B.B. King, and studied the transcendent and spirited blues styles of guitarists like Stevie Ray Vaughan, Buddy Guy, and one of her major influences, this week's FUV Essentials artist, Bonnie Raitt. Bonnie Raitt's self-titled record is a classic. It still holds up as one of my all-time favorite records. This is a timeless masterpiece infused with blues, folk, and American roots music. The first song, "Bluebird," written by Stephen Stills, shows Raitt's soulful blues guitar playing has hints of Joni Mitchell, CSNY, and Son House. I love how this track changes course, taking you down a dusty road one minute and then ending up on streets of Chicago. She has already started to create her signature style on this record. The next track, Sippie Wallace's "Mighty Tight Woman," takes you back in time to a smoky honky-tonk piano bar. Her voice is smooth, yet soulful and gutsy. The piano pulls you into her storytelling. Bonnie brings light to many of the great artists who influenced her. Track three, "Thank You," is the first original on the record. I love her warm and round guitar tone, invoking a jazzier feel with nice chord changes, blending an influence of Curtis Mayfield and Percy Mayfield. Bonnie's own "Finest Lovin' Man" is a fine mix of blues and a groove, like Booker T's "Green Onions." Bonnie rocks this tune and it's a fun one to play. The sixth track, Tommy Johnson's "Big Road," is one of my favorites of her covers. This song shows off her fine Delta blues chops. The walking bass line and brassy acoustic turnarounds sound wonderful along with Junior Wells's harmonica. A great recording and wonderful interactions with all the musicians. One thing Bonnie always does well is sing the hell out of a ballad. I really enjoy "I Ain't Blue." Her voice is a perfect blend of sweetness, soul, and blues. Always telling a story, she makes you feel just what she's feeling. The title track "Give it Up" is uplifting and fun. I love the rowdiness of this track infusing Dixieland, New Orleans grooves, and the blues. Her slide playing and sassy attitude are wildly beyond her 23 years here. Recording with musicians like Dave Holland on bass and Daniel "Freebo" Friedberg on tuba shows the complex diversity in her playing and interactions. You've got to love John Payne's clarinet on this track. "Love Me Like a Man" by Chris Smither became a staple among young woman at blues jams. It is one of those tunes that opened the door for many artists. Two of my favorite songs on this record are "Too Long at the Fair" and Eric Kaz and Libby Titus's "Love Has No Pride." Bonnie has a way of emoting through a ballad. I personally sang this last song several times in auditions and because of it was able to be a part of some of my favorite classes and singer showcases in college. Thank you, Bonnie and Linda Rondstadt, for your inspiration with this song! What a collaboration of musicians! Bonnie knows how to pick em'! Taj Mahal, Jim Keltner, Lowell George and Little Feat, and more. All I can say is "Wow!" Buy this record if you don't have it. She has moments of rocking soul, doo-wop, blues, reggae, and killer ballads on this record! Her guitar and voice are in top form. Love this record! Most people know this record and for good reason. She won some Grammys for this one. I love her slide playing on John Hiatt's "Thing Called Love." He's one of my favorite songwriters and she makes it her own. I used to play "Nobody's Girl" and "I Ain't Gonna Let You Break my Heart Again" over and over again. She has a way of singing straight to your heart and emotions. "Nick of Time," "Love Letter" and "Have a Heart" are songs that introduced Bonnie to a wider audience. She gets it done! Another fun record with two fabulous hits. I never get tired of hearing her voice and beautiful breath support on "I Can't Make You Love Me." This is a track for the ages. Can't leave out "Something to Talk About" either. Once again great guitar work and singing on this entire record. Brava! Amazing musician and an amazing person And a wonderful career that still going strong. Bonnie, you are an inspiration. Thanks for making blues and music approachable in a man's world. Thanks for all you do!